MSNBC’s Chris Hayes revealed on Wednesday that he might have had something to do with Donald Trump’s victory in last week’s presidential election. A March tweet by Hayes was recently resurfaced, suggesting that the “All In” host may have made a deal with the devil in which he traded a Trump presidency for a drought-ending Chicago Cubs victory in this year’s MLB World Series. “What if the devil himself visits me & says: ‘I can give you a Cubs World Series victory, but then Trump becomes President,'” Hayes wrote in the tweet. Hayes has been a vocal Cubs fan on social media, sharing a video of himself drunkenly singing in celebration the night they won the World Series for the first time in over a century. At the time of Hayes’ original March 25 tweet, both Trump and Democratic candidate Hillary Clinton were the frontrunners in their respective party primaries, but neither one had received enough delegates to clinch the nomination. The Cubs, meanwhile, were still a week out from their first game of the season on April 4. Next thought: what if the devil himself visits me & says: "I can give you a Cubs World Series victory, but then Trump becomes President." @libbycwatson I'm sorry. It had been 108 years! The greatest sports moment in our lifetime has arrived after arguably the greatest baseball game ever played. The Chicago Cubs, after 108 years of suffering, are World Series Champions. Aside from the Boston Red Sox's championship drought, there's no other team that has come to be defined for its combination of tradition, passion and seemingly endless tragedy. As such, the Cubs have become the basis for many jokes and stories in movies and TV. Here are 10 of the best. If you ask a Cubs fan to name a movie about their favorite team, they will almost assuredly mention "Rookie of the Year." 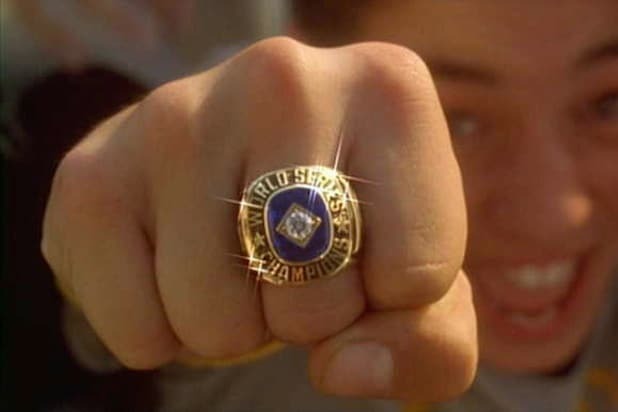 Released in 1993 at a time when baseball enjoyed cultural dominance, the family film was wish fulfillment for every Wrigleyville kid who dreamed of leading the Cubs to the promised land. "Ferris Bueller's Day Off" was once praised by Siskel & Ebert as a love letter to Chicago as it featured many of the city's most beloved sites. Among those was a trip to Wrigley Field, where Cameron (Alan Ruck) made his famous "hey batter" taunt. Of course, not every cultural reference to the Cubs is as affectionate. "Family Guy" used one of its famous clip gags to poke fun at Steve Bartman's infamous foul ball catch in the 2003 NLCS. "It's a foul ball," Stewie tells Steve. "What harm can it do?" "The Simpsons," has often made references to baseball over its long run. In the intro to one of its "Treehouse of Horror" episodes, Kang and Kodos use a time acceleration ray to speed up the World Series so they can air their Halloween special. When Kodos warns that using the ray too much could destroy the universe, Kang replies, "Good! Only then can the Cubs finally win!" In the premiere episode of the short-lived ABC drama "Revolution," the characters walk by a ruined Wrigley Field. The trailer for the series showed a banner beneath the famous Wrigley Field sign declaring that the Cubs won the World Series in 2012 just weeks before electricity went out worldwide and society collapsed. But by the time the premiere aired, the Cubs were mathematically eliminated from the playoffs, so the banner was removed. For decades, sportscaster Harry Caray was the voice of the Cubs, and during his run on "Saturday Night Live," Will Ferrell became famous for his impersonation of Caray's wild, exuberant calls. After the Cubs won the pennant this year, Ferrell resurrected the character for a special appearance on "Jimmy Kimmel Live!" Last year, "Back to the Future" fans were abuzz about the long-awaited arrival of 2015, the year featured in Part II of the trilogy. According to Robert Zemeckis' film, that would be the year the Cubs finally won the World Series despite being long shots. Instead, the Cubs lost in the NLCS to the New York Mets, leading to memes about history being altered in front of Marty and Doc's eyes. The show that nailed its prediction about the Cubs' victory was "Parks and Recreation," which paid a visit to Chicago during its final season. The episode took place in the spring of 2017, with one character noting that the city was in a good mood "because the Cubs won the Series." Nice call, "Parks and Rec"! And finally, a commercial that imagined the moment Chicago just experienced. Five years ago, Sony aired a commercial for the video game "MLB 12 The Show," showing Chicago in teary-eyed jubilation over the Cubs winning the World Series before revealing that the victory had been achieved by a Cubs fan playing the game. Judging by the pictures and videos of the actual celebration, this commercial got it right on the nose.